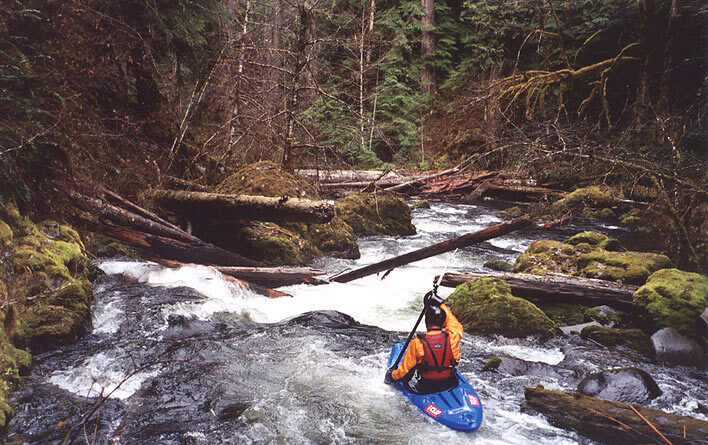 The South Fork of the Clackamas is part river run and part Indiana Jones-style adventure. Big waterfalls, tons of wood, portages through caves, and gorge-traverses over rotten logs is what this run is all about. The South Fork is definitely not recommended for most paddlers; in fact, I don't think any of us will ever go back. Still, it is quite an epic trip, so if you are a tough, adventurous kayaker looking for something new, give this one a shot.. 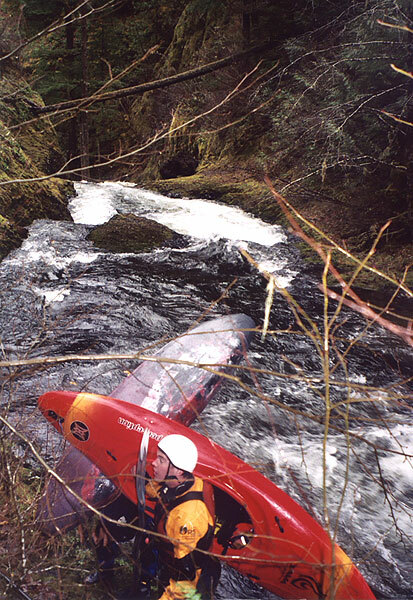 It is difficult to rate this section, because the river is so choked with wood that pretty much every rapid involves sketchy moves around, under, or over (or some combination of the three) logs. With the exception of the two waterfalls (which are very serious class five drops) most of the rapids are class II-III, with perhaps a class IV here or there. That said, the drops feel a lot harder because of the terminal log infestation on the river. We had three log pins on this trip, and many other close calls. At high water this run would be a deathtrap, rendered totally unrunnable due to wood and lack of eddies. I would describe this run as I did the Upper Upper Devils Lake Fork: "It's like hiking through the woods, except you're in a kayak, and the trees are trying to kill you.."
Once again, Pete Giordano was the driving force behind this particular adventure. 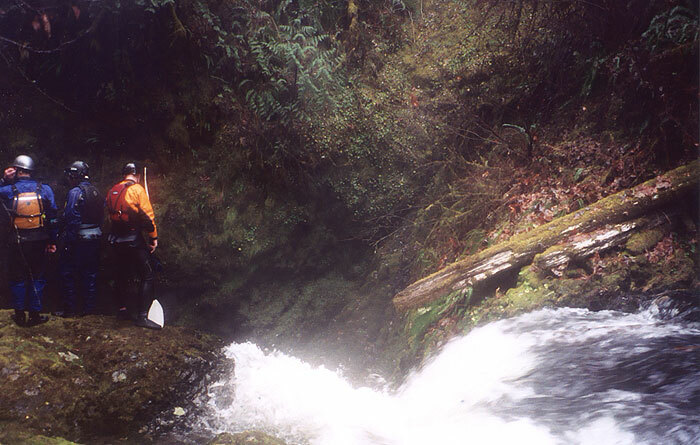 I'm pretty sure that Pete has scouted every creek in the Clackamas drainage, so he had it all figured out. All we had to do was show up, which isn't a bad deal! On this particular trip we were joined by Jon Fowlkes out of Portland, Josh Knapp out of Eugene, and Jesse Coombs of Corvallis. The run started with a 1.5 mile downhill hike on a hiking trail. It was pretty easy going, and as we descended into the canyon I knew we were in for a scenic treat as we passed one gigantic old-growth fir after another. At the put-in the river looked low, which was surprising considering how much rainfall had occurred recently. All the same, we were pretty happy for the low water once we ventured a short way downstream and started log-dodging. I don't think we portaged a single rapid between the put-in and the first falls, but it was pretty hectic in there, probably 100 logs in the river in that first half mile or so. Pete, Josh and I made it to the first big falls ahead of Jon and Jesse. I didn't even consider this falls, and Pete quickly filled me in on the portage, which involved a scramble down a gully 100 yards downstream on the river-right side. While Pete lowered my boat down to me, Jesse, Jon and Josh scouted the falls. This 30-foot drop was tough. The lead-in was very narrow and ricocheted down through narrow rocky confines before blasting out into a beautiful fan of water into the pool below. The lead-in looked really hard to run upright, and most of the water flushed into an overhanging grotto in the pool below, which led to two concerns: Getting flipped at the top and mangling your way down, then flushing into the grotto below and getting stuck under there. Pretty scary stuff, and I don't think I would have attempted this one even back in my pre-accident young-and-indestructable days.. So as I watched from below, Pete shook his head and started portaging, while the J-crew (Jon, Josh, and Jesse) started hucking pieces of wood off the falls. After awhile Josh shrugged and said: "I think we're just puttin' ghosts in there.." and headed back upstream to his boat. Josh came bombing down through the narrow upper part of the falls with a THUD and a CRACK (I thought he broke his paddle!) and somehow managed to land upright, was flushed against the wall, but managed to paddle his way out. Jesse waited until Josh was clear, then gave me the thumbs-up and came rocketing down through the narrow entrance with another loud CRACK! (broken paddle ?!?) he went straight in, surfacing upside down in the grotto, and managed to hang out until he flushed along the wall, rolling up below with a grin! 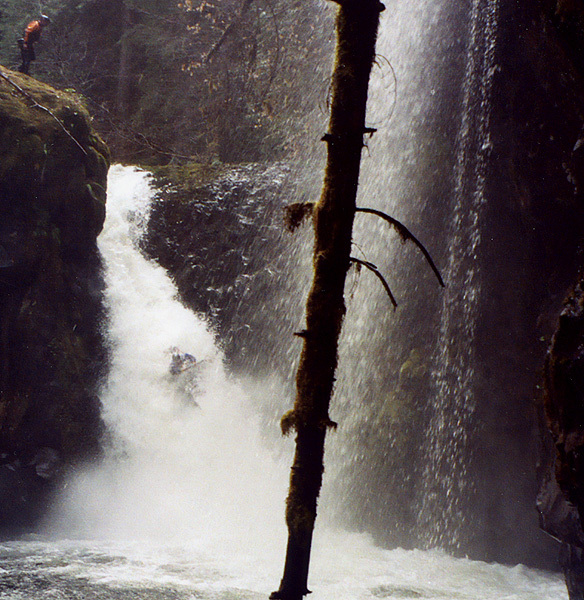 Jesse Coombs goes for the gut on the first falls; he was underwater for a long time! Jon Fowlkes enters one of the cleaner rapids we encountered on the South Fork. Downstream it was more wood, in fact the rapids got steeper and woodier, if that was possible. Somewhere in here Jesse got hung up on a log and I pulled him off, then we got to a crazy limbo under a log above a twisty rapid. Jon went first, then Jesse, both barely squeezing under the top log, then flailing one-handed as they cleared the log and tried to get their other hand on their paddle as they dropped out of sight... hmmm.. that looks pretty exciting, I thought.. I was next. 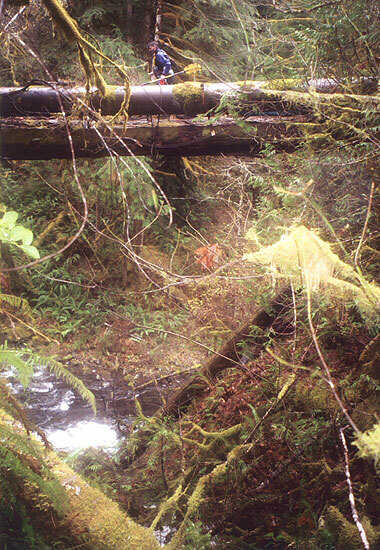 I caught the eddy above the limbo log, and spent a moment calculating if I could get under it. The log was about 1.5 feet off the surface, and with the rapid just below and fast water it was going to be tight. I peeled out and lay back over my stern, but the throwrope around my back prevented me from getting all the way down, so I wedged fast. 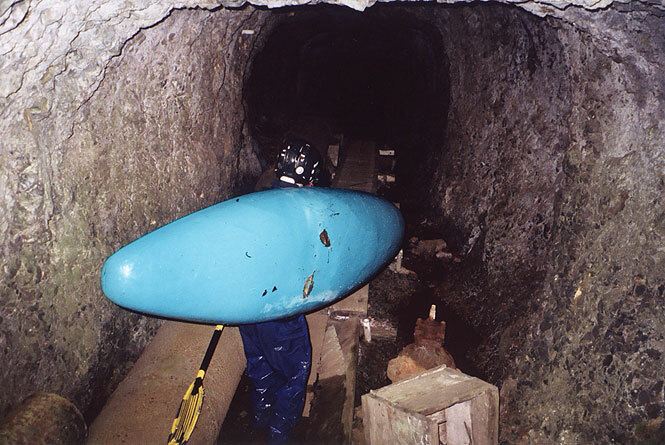 I let go of my paddle with one hand and pushed myself down into the water, and as the current loaded up my stern my boat lunged forward unexpectedly, sweeping my paddle up and over my head, where it wedged vertically behind me, with one blade on the bottom and the other against the log! 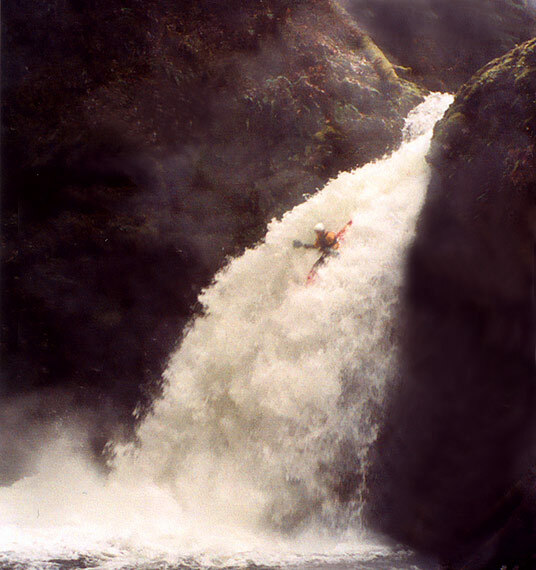 So there I was, hanging onto my paddle for dear life, bent backwards over my stern, feeling pretty stupid but unwilling to let my paddle go.. As usually happens, though, the river made the decision for me as the current swept me over the drop and pried the paddle out of my fingers. Shoot, guess I'm hand paddling this one.. but as my 'paddling buddies' hooted and hollered and cheered me on my paddle popped loose and I scooped it up out of the foam and ran the drop, ending up looking like I knew what I was doing.. Soon enough we arrived at the next falls, another hard 30-footer that also had a narrow, violent lead-in to a huge fan of water shooting into a huge punchbowl below. Below the falls the river hung a hard left and exited into a blind gorge. "No way. I don't like this one." Jesse said, peering down into the narrow entrance to the falls. I looked around. "Damn, Pete.." I said. "How in the hell do we portage this thing?" Jon Fowlkes ponders the burly entrance to the lower falls while Pete and Jesse look at portaging options..
"If you're going to portage, climb up to the left, then down to the river." Pete said, and off I went. The portage took a little while, and once I got downstream I climbed down to river level and traversed my way a 100 feet upstream along the vertical gorge wall with my camera, in case someone decided to run the falls. Sure enough, Josh was getting ready by the time I got in position, and after a few moments he came soaring down, disappearing into the foam and popping up downstream, upright but shaking his head a little. "Took a hit. Landed too flat." he said as he drifted by..
Jon and Pete opted to do a wild throw-and-go into the pool, and once they finished leaping into the swirling pool and gathering up their gear, we headed downstream. Jesse runs a pretty typical ledge-drop below the second falls; there were probably four or five little ledges like this on the lower part of the run. "Yep!" Pete called out cheerfully from the inky darkness. "Hope you brought a headlamp!" "We're going in THERE ?!? Josh climbs out of the eddy above the 120-foot falls and contemplates the narrow cave entrance in disbelief..
Pete edges down the walkway into the Donkey-Kong cave that descends around the 120-foot falls. After a couple of hundred feet we saw light ahead and we emerged at a 30-foot long log bridge that spanned a sixty-foot deep gorge. The two logs forming the bridge looked really old, and you could see where one of the logs (that used be part of the bridge!) had rotted through and fallen into the gorge..
Jon didn't even hesitate; he kept on walking, but once he reached the middle of the log-bridge the logs started flexing and he froze.. for about 30 seconds, while the rest of us held our breath. "Hmm. I don't think I'd carry my boat across like that." Pete observed. "It makes you heavier.."
Finally Jon started edging forward again and at long last he made it to the other side and sat down abruptly. "How much does Jon weigh?" Josh wondered, doing the math.. "Hmmm. I think I'm lighter than he is.." and with that, he shouldered his boat and started across. "Dude. f--k this. I'm not walking across this thing." I groaned, watching the logs buckle and flex under Josh's feet. I shouldered my boat and starting the traverse along the cliff-wall around the bridge..
Pete edges his way across the terrifying rotten log-bridge next to the old water pipe..
note that one of the logs from this 'bridge' has fallen into the gorge sixty feet below..
Below the old log bridge we started hoofing it down an old path, until we came to the 60-foot falls that a group of local boaters ran last year. Everyone scouted it but me, I just kept right on going through a couple more short caves down to the river below the falls. Josh spent a long time looking at the 60'er, but in the end he decided there wasn't enough water to soften the impact, so he shouldered his boat and headed downstream with the rest of us.. The usual suspects, at the take-out. From the left: Josh Knapp, Pete Giordano, Jon Fowlkes, Jesse Coombs. Flows: We ran this section after a pretty good rainstorm, but we were probably one day too late. 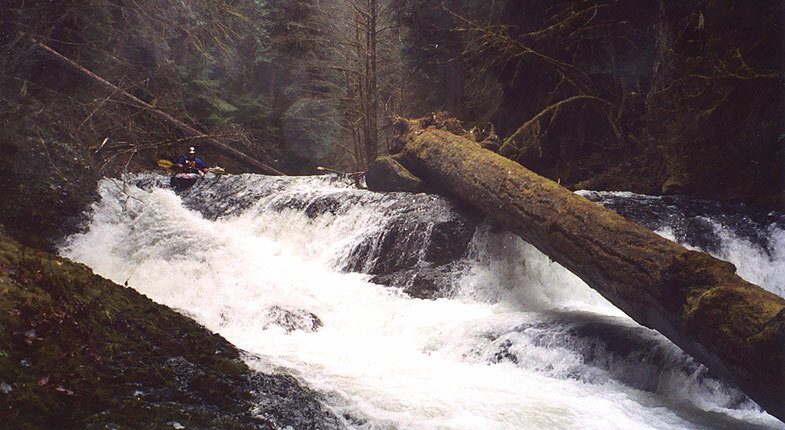 You wouldn't want high water on this run because of the wood, but we could have used 50% more water for sure.. probably about 4000 cfs on the 3 Lynx gauge would be pretty good..
Access: You take out on the main Clackamas just below the confluence of the South Fork. Access the put-in by returning to Estacada, crossing the Clackamas on the North side of town on highway 211, then drive about two miles and turn left on Hillockburn Rd. Drive up about 7 miles or so to a dirt parking area on the left, which is the trailhead. From there it is about a half hour downhill hike to the river, on a good trail. The flows taken on the day of this report. We missed the good flows by a day..